Audiojack’s Gruuv imprint kicks off 2013 will a five track EP from Tom Budden & Forrest, featuring reworks from Coat Of Arms, OOFT! and X-Press 2. 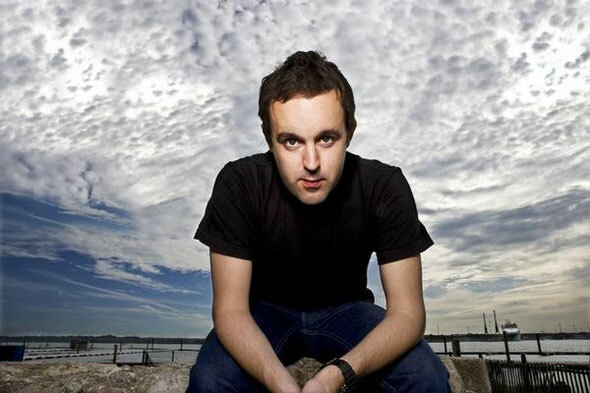 Tom Budden has been heavily involved in the industry for several years now, working with the likes of Time Has Changed and Suara and launched his own label, Alive, in 2008, which has welcomed artists in the shape of KRL, Rebel, Bubba & T-Bone and Chris James onto its roster. The release opens with the original mix of ‘Lady Is Trouble’, a low-slung house cut infused with hooky vocal lines, stuttering low-end tones and remnants of retro, disco-house. 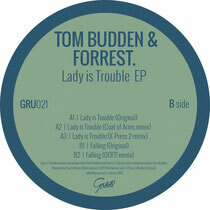 Budden & Forrest keep the groove simple, employing warm hi-strings and shuffling drums while the emotive vocal lines carry the musicality of the track. Next is Coat Of Arms aka Chris James (Formerly Chris James & Eats Everything). Here Chris unleashes some heady, bass driven melodic house, implanting a signature bumping, tom-driven bass line on the original number and tightly blending an amalgamation of raw stabs, fluttering pads and modulated vocals to create another interpretation. House aficionado’s X-Press 2 aka Rocky & Diesel rework ‘Lady Is Trouble’ next, as expected the mix is straight up house music, fusing delayed Rhodes licks, blocky bass tones and set-back swung drums as its driving force. Simplicity is key here with the tracks groove-driven vibe laying the foundations while the sensual vocals meander around them. Up next is Tom Budden’s solo venture on the release, ‘Falling’, veering things into darker territories with eerie bass tones, heavily delayed claps and low-pitched vocals. Budden steadily evolves the cut to a peak where he plays on variations of the melodic elements, creating an evolving dynamic. Closing the release is OOFT!, with a contemporary disco rework of ‘Falling’, a pitched-down house vibe with crunchy drums, a dubbed out stab line and some old school resonant synth action. It’s out today. It's in fact very difficult in this active life to listen news on TV, thus I only use the web for that reason, and obtain the latest information. We absolutely love your blog and find almost all of your post's to be just what I'm looking for. Does one offer guest writers to write content for you personally? I wouldn't mind creating a post or elaborating on many of the subjects you write regarding here. Again, awesome web site! It's going to be finish of mine day, but before ending I am reading this great piece of writing to increase my know-how. Oh my goodness! Amazing article dude! Thanks, However I am going through difficulties with your RSS. I don't know why I can't subscribe to it. Is there anyone else getting the same RSS problems? Anyone that knows the solution can you kindly respond? Thanks!! wonderful points altogether, you simply gained a emblem new reader. What could you suggest about your submit that you simply made a few days ago? Any sure? Hi every one, here every one is sharing these kinds of know-how, so it's pleasant to read this blog, and I used to go to see this webpage every day. What i don't understood is in truth how you are not actually much more smartly-appreciated than you may be right now. You are very intelligent. You know therefore significantly on the subject of this matter, made me for my part believe it from numerous various angles. Its like women and men are not interested until it is something to accomplish with Woman gaga! Your personal stuffs excellent. At all times handle it up! May I simply say what a relief to discover somebody that actually knows what they are talking about on the internet. You certainly know how to bring a problem to light and make it important. A lot more people must check this out and understand this side of your story. I can't believe you're not more popular since you certainly have the gift.